CraftQL is a drop-in GraphQL server for your Craft CMS implementation. 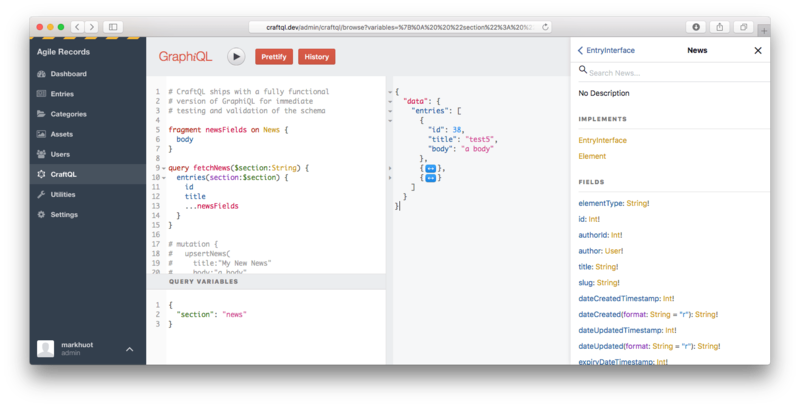 With zero configuration, CraftQL allows you to access all of Craft’s features through a familiar GraphQL interface. Unfamiliar with GraphQL? Earlier today Ryan Glover (Ponyfoo) posted a great introduction to it. In the admin interface you get a GraphiQL interface, and the ability to define access rights per token you generate. CraftQL provides a top level entries field that takes the same arguments as craft.entries does in your template. This is the most commonly used field/access point. Whilst everything is quite self-explanatory, a video on how to set it up is included in the “Headless Craft CMS” video series over at CraftQuest. The Installing GraphQL via CraftQL introductory video is one of the free videos you can watch over there.